When you purchase a certified pre owned fire apparatus from Firetrucks Unlimited you can be confident your truck will be delivered in safe condition and will look great. We will service every mechanical system on your truck. We will perform a 150 point check list and replace the engine and transmission fluids and filters. We will inspect the pump valves and systems, the ladders and hydraulics, the lights and warning systems and the generator. Every truck we sell comes with a current pump and aerial certification (if applicable) and any available maintenance records. DOT inspections include checking the frame, axles, tires, brakes, steering, road related safety devices and headlights. A DOT certification indicates that your pre owned fire apparatus will operate safely on the road. We will remove the previous departments lettering and polish the truck to restore a clean surface. Our expert technicians will then apply professionally prepared vinyl lettering of your choice. We will also repair any damage to the interior upholstery so your truck looks and feels like new. We also offer paint jobs for an additional fee. Our 90 day comprehensive warranty begins the day you receive your truck. If you have a warranty claim, you may use your preferred local service technicians at our expense. You will receive the full terms and conditions of the warranty before completion of the sale. We will work with you to determine the best method of delivery for your truck. An insured tractor trailer or experienced CDL driver will deliver the truck at the time of your choosing. Firetrucks Unlimited is a full service refurbishment facility. We have the capabilities to completely refurbish every component of your apparatus. Visit the fire truck refurbishment page to learn more about the options we offer. 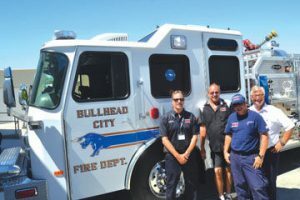 Firetrucks Unlimited stands behind every certified truck we deliver. You can count on us to provide safe, reliable and great looking trucks for your department.